SOLUTIONS congratulates Dr. Claudia Lindim Fontes, project partner from ACES – Department of Environmental Science and Analytical Chemistry – Stockholm University. 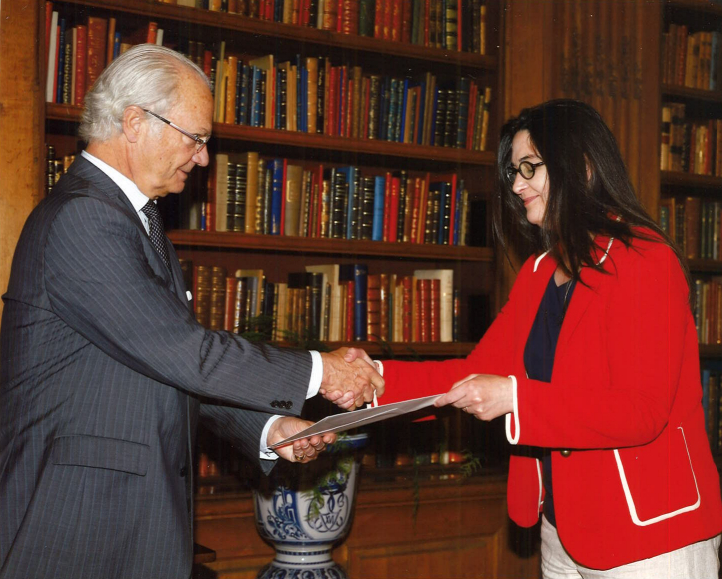 Dr. Lindim Fontes has been awarded by the King Carl XVI 50-year Foundation for Science, Technology and Environment. The Swedish Royal Foundation supports research, technical development and business ideas that promote a sustainable use of natural resources and conservation of biodiversity. The award ceremony took place on 31 May 2016 at the Royal Palace in central Stockholm, Sweden. Dr. Lindim Fontes received the award for her work on the assessment of the emerging contaminants perfluorooctanesulfonic acid (PFOS) and perfluorooctanoic acid (PFOA) in surface waters. The STREAM-EU (Spatially and Temporally Resolved Exposure Assessment Model for EUropean basins) model, currently being used in SOLUTIONS to simulate fate and transport of multiple waterborne pollutants in river catchments, was used for the assessment of PFOS and PFOA.